It's not every day that you stumble into a mountain restaurant in Switzerland owned by a jolly Irish ex-musician and his equally gorgeous and cheery Dutch wife. You feel like you've just been greeted by the best friends you haven't seen for a few years who have been awaiting your return. 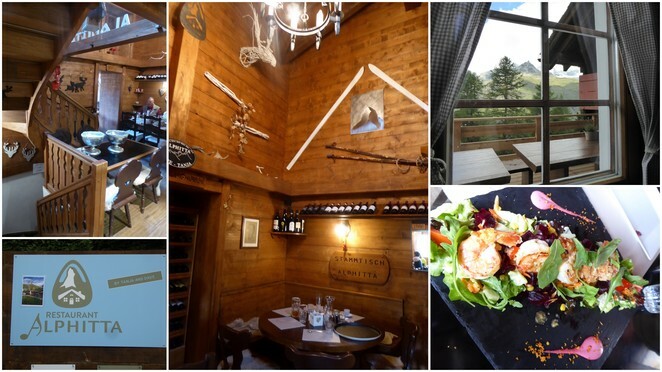 Alphitta, meaning mountain hut, was recommended to us by our hosts, hotel owners Mario and Katja Notti. They own and run the Bellerive in Zermatt. Such lovely hosts with a tastefully designed, decorated and run hotel must have good taste in their recommendations too. Yesterday's in-town lunch suggestion was pretty good. Today's needed to be good too as it wasn't that easy to get to. We rode the Gornergrat Alpine Railway to the top of the mountain where you find highest hotel in the Swiss Alps, the 3100 Kulm Gornergrat. 3100 because that's the elevation in metres. That's about 10,000 feet. The views in all directions are spectacular with hiking trails in summer and skiing in winter. There are several places to eat here but with a recommendation so nicely described by our host Mario, we explored and took our photos, and boarded the Gornergrat rail to descend to Riffelalp Mountain Station, a mere 2,222 metres above sea level. Remembering that the air is thinner at such an altitude, we weren't quite sure of how long the walk would be, or where we were headed. Not a problem. It's signposted. It's 600 metres of relatively flat walking, and you have many people to walk with. In Summer, the mountain abounds with hikers wearing colourful jackets and many carry walking staffs? In Winter, you can ski in. Alphitta's website has instructions for both summer and winter access, depending on whether you hike, ride the train, or ski. You know you're almost there when you see the 5 star Riffelalp Resort which is virtually next door, and has its own mini-train to meet guests at the Riffelalp Mountain Station. On arrival, you discover a gorgeous brown timber building with red shutters on the side of the mountain with a large outdoor deck looking directly at the magnificent Matterhorn Mountain. Indoors, there are several cosy rooms and alcoves. Deciding where to eat was easy. Our chatty host, Dave found us a cozy corner table with plenty of room to off-load hats and jackets, and with an amazing view. Although it was a clear and sunny summer's day, it was cold outside. We quickly learned that Dave hails from Ireland, and his wife Tanja is from the Netherlands. Notwithstanding that, they are now well entrenched Zermatt locals. Often places in prime positions trade on their views and forget to serve good food! Not here. We were delighted with our generous shared 'snack' on our way down the mountain, and equally impressed by the vast array or plated dishes that passed our table during lunch. We had more walking to do, so weren't geared up for a long and lazy lunch. 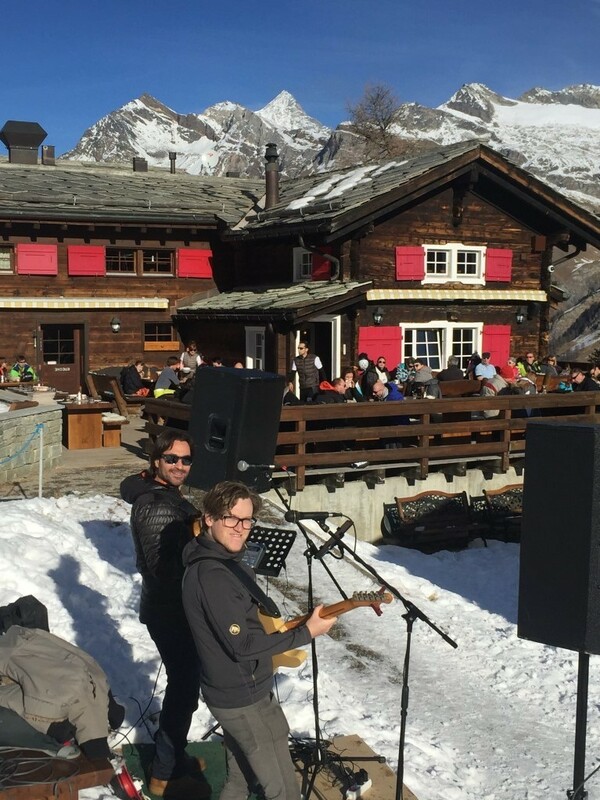 Alphitta is a popular stopping off point for hikers and skiers as many return to their base at Zermatt, or just pop in for a break from their activities. Almost every indoor seat was taken. The kitchen was busy and guests continued to arrive, even as we departed in the early afternoon. Getting there: We travelled by train from Zurich to Zermatt, part of which included the legendary Glacier Express. The A4 is fastest route by road, quoted to be 215 kms. Why? Location, food, service, atmosphere and panoramic views. Operating more than 40 years.